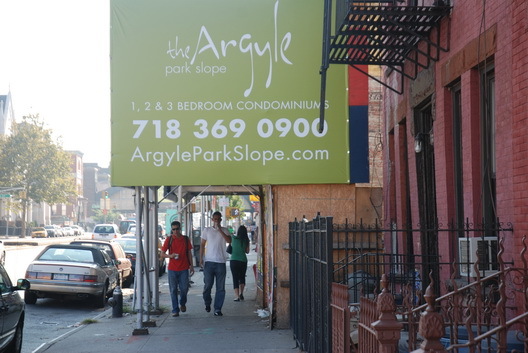 The Gowanus Lounge: Argyle Marks Its Turf in "Park Slope"
Argyle Marks Its Turf in "Park Slope"
We noted the coming of the marketing effort for the Argyle Park Slope condos last week. The banners recently went up at the construction site as well. According to the Department of Buildings website, there is still a Stop Work Order on the project for damaging an adjacent building. We personally don't consider the address, which is on the Gowanus Canal side of Fourth Avenue, with part of the building going up on Seventh Street between Third and Fourth Avenues to be part of Park Slope, but that part of the neighborhoods is clearly the Slope for marketing purposes these days.